PowerPoint file repair tool repairs PowerPoint presentation files and restores headers and footnotes. Software successfully repairs all versions of MS PowerPoint corrupt PPT files including MS PowerPoint 97, MS PowerPoint 98, MS PowerPoint 2003 and MS PowerPoint XP. 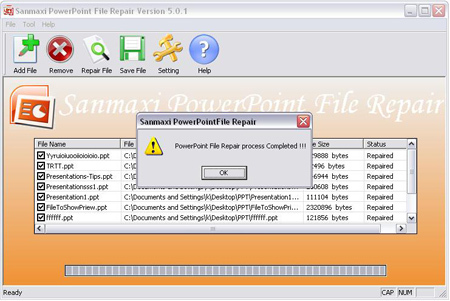 Download demo version ppt repair utility software from our website and install on your computer and see the preview of repaired files but you can not able to save file. PPT repair software fix repairs corrupt or damaged Microsoft PowerPoint files. ...... to virus attacks. Home users, security administrator, technical administrators and computer professionals, are easily repair ppt files corruption.
? PowerPoint File Repair software repairs corrupt or damaged PowerPoint 98/2003/XP/2000 presentation files and successfully searching restore repairing the corruptions corrupted inaccessible .ppt files.
? PowerPoint file repair tool evaluation version restore corrupt damaged ppt file and repair corrupted PowerPoint presentations and displays preview of the presentation files.
? Restore damaged MS PowerPoint files software supports PowerPoint Version 98/2003/2002/XP/2000 created files.
? Professional PPT repair program supports windows operating system 98, 2000, 2003, XP and Window Vista. See the password hidden with asterisks. Qweas is providing links to Open Corrupted PPT 5.0.1 as a courtesy, and makes no representations regarding Open Corrupted PPT or any other applications or any information related thereto. Any questions, complaints or claims regarding this application Open Corrupted PPT 5.0.1 must be directed to the appropriate software vendor. You may click the publisher link of Open Corrupted PPT on the top of this page to get more details about the vendor.